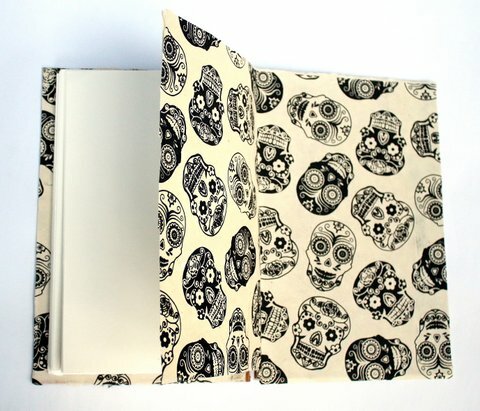 I’ve never used endpapers, but I bought some beautiful sugar skull paper in NYC that I’d been anxious to use and terrified to screw up. Because I generally collage the covers, I didn’t want to waste it there, but the bold pattern made for a great inside cover/endpaper combo. Keeping them inside almost makes the paper less likely to get damaged, as I’m pretty hard on a notebook. Building Mona also gave me a chance to use two old patches from my high school collection; a pair of fuzzy dice that adorned a black sweater and brass knuckles that were on an old hoodie. 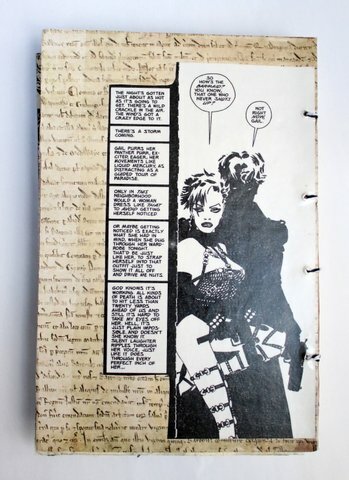 This is a very tactile notebook, which is something I’ve been intending to explore with my book arts. Mona gets her name from several sources — the first, the character Ramona in Eric Powell’s The Goon (I had a real problem with Occasions of Revenge, both as a woman and a writer, because Powell’s narrative was cheap, relying on coincidences and cliches rather than building an actual story) but that’s her picture adorning the front cover. The second is from Donald Fagen’s “The Night Belongs to Mona” off Morph the Cat. It’s one of my musical obsessions at the moment (along with Chastity Belt’s “Joke“). 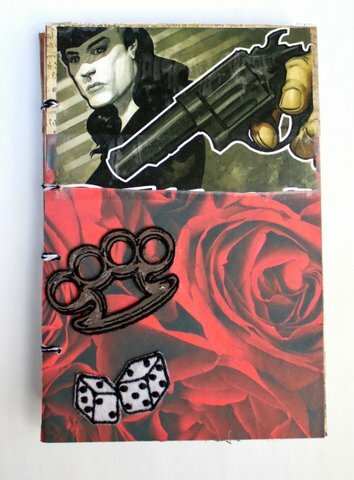 Also, because it’s a crime writing notebook, Warren Zevon’s “Bullet For Ramona” was a minor inspiration. The back cover features a panel from The Big Fat Kill, because I had a papercrafting copy laying around, left over from a CD booklet I made Jason for his birthday. So while yes, Mona is not what I planned or expected her to be, I’m pleased with the results. Every notebook I make teaches me something new and strengthens my skills. One of the things I struggle with in making these notebooks is the line between design and function. I’ve conceptualized books made in matchboxes and Altoids tins, but will they serve the purpose I need them to serve? Doubtful. But I don’t just want to write in boring, generic journals either. They have to be sturdy but artistic, interesting but not distracting. It’s an ongoing process, but luckily, I write enough where I will always need a new notebook!. You forgot to mention that Mons was also Luke Skywalker’s wife.